I haven’t spoken about young Miss Arriba Mordida Heise very much since Christine and I welcomed the tiny 2 pound, six inch long kitten into our condo back in mid September 2017. Cats weren’t allowed in our condo and as this is a publicly viewable blog that I put my real name on, you do the math. However, the end of our time in that condo – and in Panama itself – has arrived. Arriba and I flew back to the USA together on Monday afternoon, the 19th of June. I didn’t write about my parents’ visit to Panama in early May; I had just had my Galaxy S8 lost/left behind (and then immediately stolen) from a bus a few weeks after my last blog post regarding Mexico, and I was feeling pretty depressed. When you don’t have a job and you’d only owned your flagship smartphone for six months before losing it, some people might tend to mentally beat themselves up a lot. I wasn’t in the mood to write very much. But my parents enjoyed meeting the feisty, spritely and energetic kitten that they’d come to know from Christine and I sending private messages and photos to our shared family Google Hangouts chat. 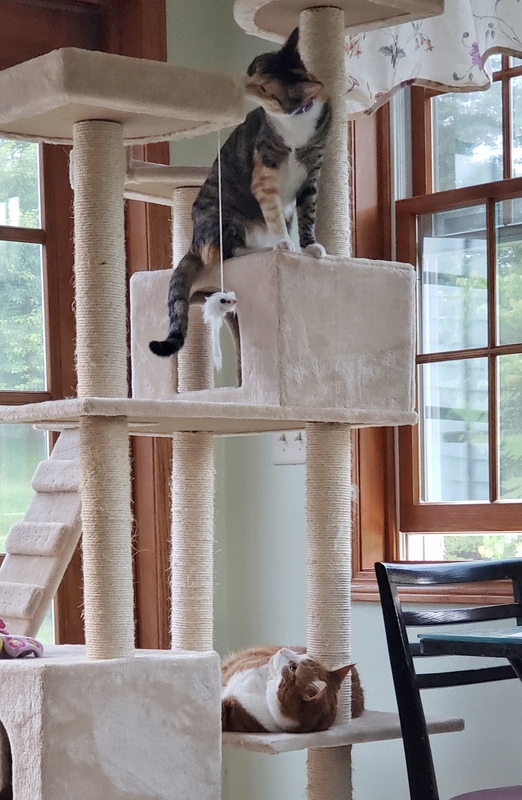 They knew that we were having trouble finding a forever home for a spirited – and unfortunately a bit bitey, as you’d guess from the middle name I gave her – 10 month old kitten. My mother was a bit dubious – how would a single female kitten fit with their current cat, a large plump male orange tabby? My father, the softy that he is, seemed instantly smitten with her playful ways, and although she wasn’t on her best behavior for the two of them, her sheer playfulness and loads of personality seemed to be winning them over. A few days after they flew back to the USA, they told me they’d acquire a second female cat of a similar age, whom they named Mariposa, the Spanish word for Butterfly (one of their favorite hotels in Panama was called the Casa Mariposa in Valle de Anton, the same place where Clayton and Aurelia stayed back in January). Mariposa and Riba could be buddies so old man Suleiman, the orange tabby, wouldn’t feel too stressed by lots of kitten attention directed solely at him. Now Arriba would have a home. Christine and I were thrilled. She, however, is staying in Panama for a few more weeks before doing some more traveling (you may have heard of the 330 Rule if you’re an expat) so we both knew right away that the task of bringing Riba to live with her grandparents would fall entirely to me. I wasn’t looking forward to it, but for the opportunity to see Riba live out her life only an hour from me instead of thousands of miles away in Panama, I decided it would be worth it. Now, what airline to choose? Kayak made it easy: the only options seemed to be the hated Spirit Airlines, bane of laid-over travelers, or the pricey United subsidiary, Copa Airlines, based out of Panama. Spirit didn’t accept pet travel internationally. That only left Copa. And they only allowed pet travel on weekdays, not weekends, so there you go, I already had narrowed down my possible flight days by a quarter. We purchased some Feliway cat calming pheromone spray, and a new soft-sided cat carrying case – Copa’s website told us that our current hard-sided carrier would be too large to be used, but for whatever reason, the dimension limitations for soft sided cases was greater by an inch in all directions. I’ve been saying jokingly that Arriba is our little dandelion cat: acquired from the scrappy streets of Panama, her genetics are built to survive off of trash and whatever she could scrounge up. Imagine bringing a dandelion into your home and caring for it like a prized houseplant. Riba has grown quite large, long, and lanky over the past six months of what I know is her “adulthood” now, but in my mind she’ll always be the tiny month-old kitten, crawling onto my shoulder and falling asleep. My goodness, how she’s grown though. Still acts like a kitten though! Anyway, what I’m getting at is that it was a tight fit for her in her new carrier. She’s not heavy; Copa restricts total weight of pet and carrier to 20lbs, and Riba by herself is a mere 10 pounds. But because of her long body, it meant that it would not be a comfortable five hour flight for her. And five hours? Add the time it takes to get from El Cangrejo, to Tocumen, to waiting in the airport, to the flight itself, to getting through USA customs, to driving back to Wisconsin (three hours) and you’re looking at twelve hours of your cat being in a cramped little carrier case. The afternoon of the flight arrived, and at 3pm, Christine and I loaded Riba into her new carrier (she had already learned to dislike it after a twenty minute walk down the busy side streets of the city to get her export papers from a local veterinarian) along with my bags. 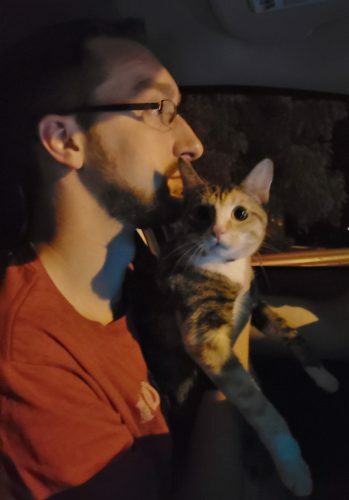 As my hands were literally full enough already, Christine accompanied me to the airport to help sooth the frightened kitten in the car and carry her for the last time. Carlos, our Uber driver, spoke flawless English on account of his father being a Caribbean canal worker who spoke only English at home. He had some interesting ideas on whether or not children should be smacked when they backtalk, which we found a bit odd he’d bring up to random strangers in his car, but that’s Panama for you. He was a great driver and conversationalist regardless, and got us to the airport for only $11.50 – perhaps a new record for me, and I’ve had to have paid $28 in the past! At the airport, the Copa bag checkers were literally the only people who inspected Riba’s hard-won and $100 paperwork to leave the country of her birth, and weighed her to make sure both she and her bag (and kitty litter, and food, and treats) were under the 9kg limit. Even their inspection of her forms seemed to be limited to looking to make sure it had an official ministry of agriculture seal on it and that she had her vaccination label stickers pasted onto her vet form. Once that was done, we were sent on our way. The kitten was mostly quiet at this time, happy to be out of the car and fascinated by the rush of people through Tocumen; probably more people than she’d ever seen in her life. As a cat who loves to jump into suitcases, the sight of so many tantalizing rolling cat-playhouses was probably filling her heart with longing. Christine petted her a little bit more and then she bid farewell to the two of us; we won’t be meeting again til late August. Now it was just me, my personal item (backpack), carry-on (rolling suitcase) and the cat. My hands were mostly free now that the big bags were checked, but it was still an awkward stumble through security. Christine had tutored me on the proper Spanish way to ask for an enclosed “private screening” for the cat and her bag, because we didn’t want to run the risk of her leaping from my arms and disappearing forever into the airport, but the Panamanian TSA equivalents literally laughed at me when I tried asking for it, and told me to hold the cat in my arms. Thanks, boys. Still in people-shock, Riba was mostly quiet in my arms, although thankfully she was wearing her calming collar and it gave me something to tightly grip as we stepped through the x-ray scanner. Moments later, the agents would force me to empty out every single electronic item from my backpack and suitcase for a rescan, as Riba crouched helplessly and trembling in her bag, surrounded by clunking conveyor belts and people putting their shoes back on. Panama had to inconvenience me one last time before I left, after all! Or rather, not quite the last time. 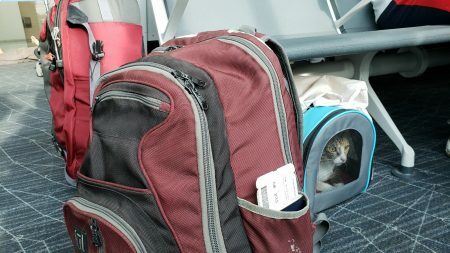 Riba was becoming less shocked and more agitated as walked through the airport together, but I would have to go through the remove-cat-and-hold a second time at the gate itself, and this time she was squirming and hissing loudly at anyone she made eye contact with. At least she was eager to clamber back into her bag, away from prying eyes, and I dropped a pillowcase I’d brought for just this turn of events the mesh screens she was glaring out at me from. A small child, sitting across from me in the gate waiting area, started pantomiming a puppy and woofing at her, but at least he did have the decency to shut up when I gently told him that the airport was a scary place for her and that she would like some quiet. Then, Copa’s gate agent came up to me and confirmed who I was, and gestured to Riba. Sir, you currently hold a middle seat in the back of the plane, yes? I confirmed that I did; I had chosen it specially so that my cat would have less people and possibly less noise around her. Well I’m sorry, but here’s your new seat assignment – Copa policy prohibits pets from traveling in anything but a window seat. I looked down at the ticket: 9A. “But this is right in the middle of the plane, next to the engines, surrounded by people. Please give me a window seat at the back of the plane, at least.” But none are left, sir! Well, thanks, idiots. Where on your pet transport webpage does it demand that pet-transporting ticketholders have to select a window seat? If I had known that I would have chosen 33A instead of 33B. But no, your site does not specify this. I was extremely irritated on Riba’s behalf, and if not for the fact that the gate agents had already agreed to let me go in first with the parents of small children and wheelchair-bound, I would have raised more of a stink. Onto the plane we went. The humming roar of the idling engines, such a common and constant noise for human travelers that we barely register it anymore, sent Riba into a meowing frenzy, and she writhed and spun in circles in her case, causing it to wobble dangerously in my arms. I held her cage in my lap and tried to give her treats through a small gap in the zippered opening, but she immediately forced her trembling nostrils through the gap and instantly, 3/4 of her lean tube-body was just barely in-hand, struggling to vanish into the depths of the airplane. Feeling terribly guilty, I quickly stuffed her back into the bag and put the pillowcase back over her. My seatmates were a pleasant 12 year old Colombian boy, Manuel, in the middle seat and his mother Carolina next to him. Neither spoke much English, but I was able to get my point across: my cat is named Up Bite, yes that is a strange name, yes we are moving to the USA together, I’m sorry that she is probably going to be loud and sad-sounding for the entire flight. As the plane started to taxi toward the runway, the flight attendant came by and told me that I needed to move my backpack from my feet, so I could deposit Riba under the seat in front of me. I stared at her and asked, is it policy for parents to stick their children under the seat in front of them too? She stared right back and said “it is not the same thing,” to which I bit my tongue and complied. Manuel was a real help here; he volunteered to give up his leg room for my backpack, so Riba could take to the floor. I told him that in another few years, he’d be as tall as me and not nearly as willing to give up precious leg room for a stranger with a noisy cat! His mother beamed proudly at him. Grudgingly, I’ll admit that the flight attendant had the right idea anyway – soon after takeoff, Riba’s meows trailed off, and the bag trembled at my feet far less. I knew there were often blasts of cold air near our feet, so I stuffed an extra shirt between the wall and her bag, as cats prefer to be warmer rather than colder. I was almost afraid to check on her to make sure she was asleep and not dead, knowing that all it would take was one look at me to start her meowing accusingly again. And so our five hour flight proceeded. At the halfway point I tried to give her some water and she almost leapt out again, but I was able to hold the plastic cup of water in one hand and form a barrier across the gap with the other. I briefly heard some splashes that sounded like a cat tongue – or foot, or whatever she was flailing with at that moment – and decided that was enough risk-taking. Our particular flight landed at 12:05 in the morning, but it seemed almost like our pilot got lost in the O’Hare airport runways, because we crossed back and forth over the car highway “bridge” twice before getting to the gate. All in all, we were 45 minutes later than planned, and when I finally got some free wifi inside the airport, my phone was filled with family worriedly asking me how the cat and I were faring, and why I wasn’t responding to anything. In the TSA Global Entry system, I marked that I was indeed bringing a foreign animal into the country, and moved into the blessedly quiet midnight checked luggage area. Thanks to Global Entry, I didn’t have to pass through the in-person Immigration system at all and explain the cat situation. I brought Riba into the bathroom, hoping they’d have a “family” style room that had a down-to-the-floor style door. No such luck…so time for some quick improv. I took a stall, and shoved my backpack, carry-on, and Riba’s bag itself along the gap at the bottom of the stall. 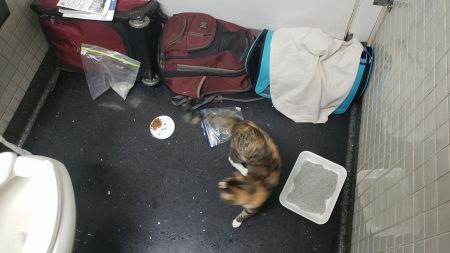 Altogether the three bulky bags were just barely enough to completely cover the bottom, and for the first time in 9 hours, Riba was free to hop out and sniff around. Her cries ceased immediately, and she purred and rubbed up against my leg before exploring her first glimpse of America… an airport bathroom. *insert political joke here* I set up a makeshift litterbox using a styrofoam vegetable tray and poured in the litter. She ignored it entirely and continued to sniff around, practically falling into the toilet on her probably sleepy and stiff legs. I was pleasantly surprised that she hadn’t made any kind of mess inside her bag. Nine hours! What a good girl. But the journey wasn’t over yet; I bagged her back up (the protests were mighty now) and returned to wait for the checked baggage to make its way out of the carousel. Ten minutes later, all was in hand, including the all-important paperwork. Now with 4 bags plus the cat, it was tough work maneuvering the checked bags, with Riba perched on top, toward the Customs exit! Of course I’m far too cheap to get one of those airport bag-carry-carts. The pair of agents manning the Customs desk, a man and woman, cooed pleasantly at Riba and collected my Global Entry piece of paper. I hesitated and said, “but she is from a foreign country though; she isn’t from the USA.” The woman laughed and said “but she’s a housepet right?” I confirmed that she was, and they waved me on without even asking me to take the forms out of their manila folder. And that was that – Riba had become an American citizen! Or as much of one as a cat can be. In another fifteen minutes, my wonderful little brother had arrived at the airport to give his brother and niece-cat a 2 hour ride back to my parents’ house. I owe him quite a bit for this! He was in a good mood though, and I read him the first part of the The Last Wish, the first book in the Polish “The Witcher” series as he drove. I’ll get him to play the game series eventually. With twenty minutes left in our ride, we were both getting a little exasperated with Arriba’s constant sad meowing, and Josh suggested (him, not me!) that I let her out of her cage so she could roam his car freely. Once again, all sadness and fear were cast aside as her urge to explore overwhelmed all other emotions. Josh’s car became her playground and she attempted to sniff every corner, and at least a dozen times in that twenty minutes I needed to grab her and prevent her from exploring under the pedals by Josh’s feet! 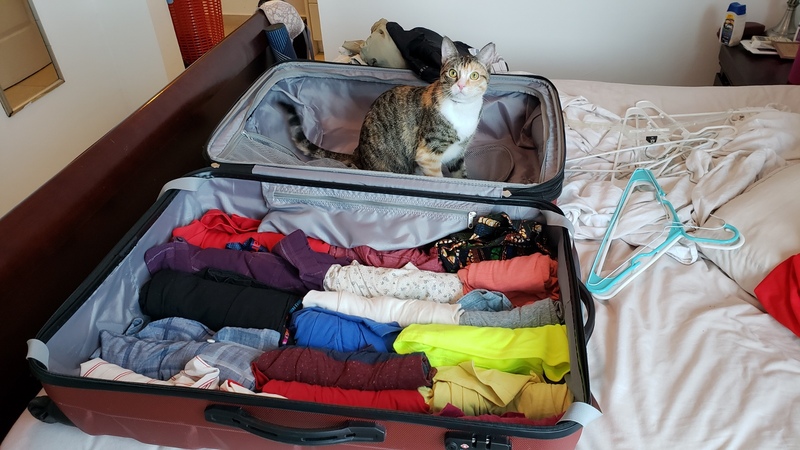 So, if you too want to make your cat an American Citizen…ish… then you’ll be glad to hear that on the USA side, flying into O’Hare at least, it’s extremely easy, unless those two Customs agents were slacking on the job. But beware, Copa travelers! Their pet webpage is a lie, and you should definitely try to pick a window back seat as quickly as you can before they fill up. Of course I sent Copa an email voicing my displeasure about this, and of course, they haven’t written me back. Riba has already become good friends with her big brother, Suleiman. Mariposa, sadly, has taken a complete fear of both cats and hides under furniture as soon as she sees them. But hopefully she’ll get over that soon… Xanax to the rescue again, perhaps? Suleiman seems to like having a friend around to keep him company again, and Riba is overjoyed to find she doesn’t have to rely on humans for playtime anymore!